I guess this is Part two to my weekend, with the Free From Skincare Awards winners announcement being the first installment. Every year the Allergy & Free From Show is top of my agenda. I pretty much empty out my bank account and hit up my favourite brands for show bargains and hopefully discover a few new ones along the way. I have filmed a show haul video which you can view here (YouTube Link) but if you prefer reading over watching I thought I'd share my show highlights here on the blog. Lets start with old favourites. I stocked up on Pudology's dairy free puds and coconut yoghurt, Nakd Bakewell Tart bars and Ms Cupcakes. 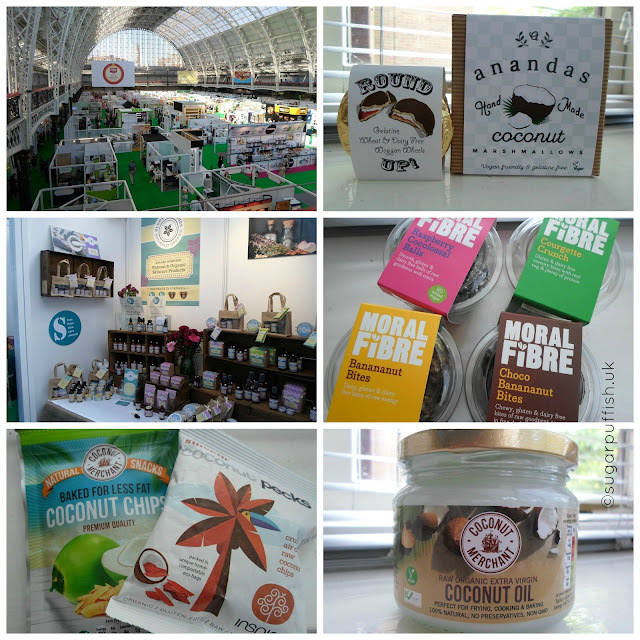 Said hello to Cocoa Libre, Amy's Kitchen, Fry's Food, Everything But The Cow, Rebel Kitchen, Smooze, Violife and I caught up with skincare brands Bloom Remedies, Bathing Beauty, Mount Purious, Nom Nom, Saaf, Soothe-Me, Greenfrog, Speiza, Bria and Itha. I did discover some new to me free from foods which is always exciting and what I enjoy most from the show. I finally managed to get my hands on the legendary Vegan Marshmallows & Round Ups (Wagon Wheels) from Ananda. I enjoyed sampling chocolate Nana Nice Cream, a dairy free frozen desert made from banana, avocados and dates (plus a few other healthy ingredients). Sensitive Souls has an impressive free from list (gluten, nut, dairy, egg, wheat, soya, sulphite & vegan) and when someone can sell me a tasty egg free brownie and vegan rocky road they have a customer for life. I also stocked up on Moral Fibre snack pots which are gluten and dairy free and more importantly delicious. A thank you to Marie of Bloom Remedies for recommending I sample Dee's Wholefoods Vegan sausages, yummy, I need to locate a stockist for those. Coconut chips seem to be the new trend in snacking and I am loving the ones from Inspiral and Coconut Merchant. I noticed this year some new apps for managing allergies. I've yet to download but thought I would mention in case readers wish to investigate - Biteappy, Can I Eat There?, FoodMaestro. Now I am always positive about the show but I do feel there are areas which could be improved upon. Even though you can fill your belly on free samples it is nice to sit down and have a sandwich or meal. Sadly, the cafes at the venue seem to lack the ability to provide a decent feed which is ironic given that this is the Allergy Show. In the end Vegan Sweet Tooth London came to my rescue with a big slice of pizza bread. Browsing through the show booklet I now see "Free From Cafe" on the map.....um! Why did I not know this? Why is that not promoted better? Could it have made a difference in my experience? I shall know for next year. I guess the other disappoint is seeing brands, which in my opinion are "greenwashed", sneak into the Love Natural Love Organic show. I guess organisers are looking to sell stands so they probably are not as fussy as I am. I do find it frustrating to see Arbonne and Forever Living alongside amazing natural brands that enter the Free From Skincare Awards. The show is also a great opportunity to catch up with people I've come to know on Twitter or through my blog. I spent my day with Jen (Jen's Green Skincare), Rachael (Myroo) and Hephzibah (Good For Me, Good For You). Thank you to everyone who said hello to me. A big shout out to the amazing Hailey of Allergy Adventures who gives the best free from hugs and high five for her amazing work helping children understand allergies. Did you attend the show this year? Did you have fun and find some new brands? I agree with you on the food aspect - for the price, there's not even that much that even I wanted to eat & I don't have allergies! I ended up getting a jacket potato for £7! Shame about the about of greenwashing brands too...Ailish & I walked past Younique and the girl said "Hi girls, have you heard of Younique?!" We were just like "Yeaaaaah" and carried on walking haha! Great post. There's some stalls I wish I'd paid more attention to and stopped at. Thanks again for the nana nice cream tip off. Yum! My round ups only lasted 2 days.